Huawei’s rise to leadership in the global smartphone market has been astonishingly fast. For years, the conversation has been dominated by Samsung and Apple. In 2018, Huawei asserted itself as a class leader in flagship smartphones. The Mate series represents the pinnacle of Huawei’s efforts in smartphone innovation, while the P series has made a name for itself with respect to camera improvements. The company’s improvements have been so speedy that it has essentially forced market leader Samsung to respond to its innovations. The first Huawei flagship I used was the Huawei P20 Pro. In my review, I praised its camera performance in low light, which set the stage for computational photography-powered night modes in phones. The Huawei P20 Pro was followed by the release of the Huawei Mate 20 and the Huawei Mate 20 Pro in October. The Mate 20 Pro acts as the top-end flagship of Huawei’s lineup, and on paper, it has nearly all of the specifications it needs to compete with even 2019 flagships. That means, of course, that it has an expensive price to match. Does it fulfill its potential of being a market leading flagship? With only two weeks left before the announcement of the Huawei P30 and P30 Pro, should readers still be interested in Huawei’s current-generation Mate series flagship? In this review, we will take an in-depth look at the Mate 20 Pro to determine this. About this review: I have the Indian LYA-L29 6GB RAM/128GB storage variant of the Huawei Mate 20 Pro for review. The unit was provided alongside the 15W Huawei wireless charger by Huawei India for reviewing purposes. The Huawei Mate 20 Pro’s design manages to distinguish itself, even in 2019. In terms of build quality, the Mate 20 Pro finds itself in a crowded company of phones. The phone has an aluminum frame, which sandwiches glass on the front and back. The usual durability caveats which apply to phones with glass backs also apply to the Mate 20 Pro. However, it seems the ship has long sailed for metal unibody flagships, so I won’t waste much time here. The aluminum frame of the Huawei Mate 20 Pro is thinner than the Huawei P20 Pro, as the phone has curved sides and a curved back. While it has nothing special when it comes to the build quality, the Huawei Mate 20 Pro’s look and feel is something different. On the front, we have a 6.39-inch OLED display with a wide display notch. The notch contains all the required components for 3D facial recognition, including a dot projector, IR camera, and flood illuminator. The Huawei Mate 20 Pro has curved display edges like Samsung’s flagship phones. This means that side bezels are virtually non-existent. Although a curved display reduces screen real estate, it also has the advantage of making the phone narrower. At 72mm wide, the Mate 20 Pro is one of the narrowest flagships I’ve used so far, and this has a positive impact on ergonomics, which are excellent. The chin is also small, which results in the Mate 20 Pro having a decent screen-to-body ratio of 87.9%. There is no physical fingerprint sensor on the front or back, as Huawei uses an optical in-display fingerprint sensor. We will comment on its speed and accuracy in the Performance section. On the top, we find an IR blaster and the microphone. At this point, Huawei is the only major device maker that continues to include an IR blaster in its flagship devices, so if users care for this feature, the Huawei Mate 20 Pro is more or less the only option. The power and volume buttons are situated on the right-hand side. I had no complaints regarding the buttons in terms of stiffness. They are easy to press, requiring the right amount of pressure. Their location is optimal as well. 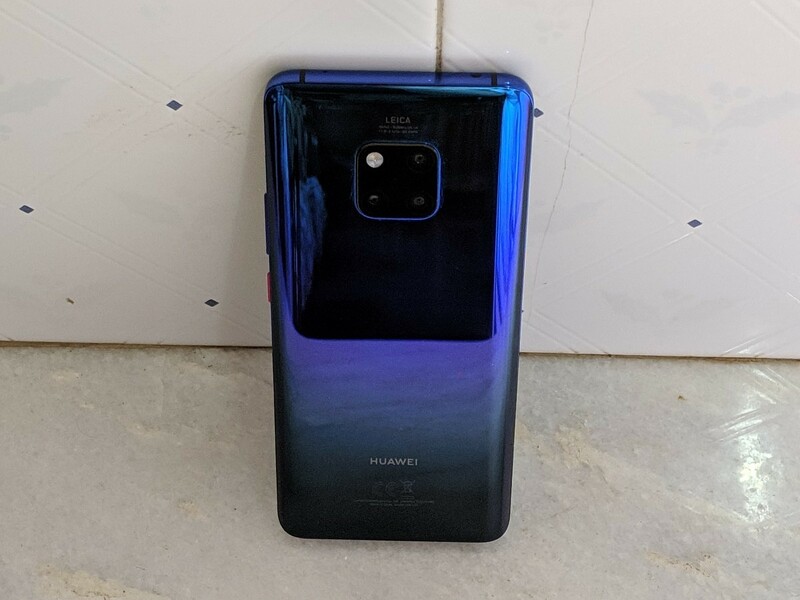 The bottom of the Huawei Mate 20 Pro is minimalist as there are no visible speaker grilles. Instead, a speaker is contained inside the USB Type-C (USB 3.1) port. (The earpiece acts as a secondary speaker.) The Huawei Mate 20 Pro lacks a 3.5mm headphone jack, forcing users to use less convenient alternatives. The back of the Mate 20 Pro is where things get interesting. First of all, we have the color scheme. 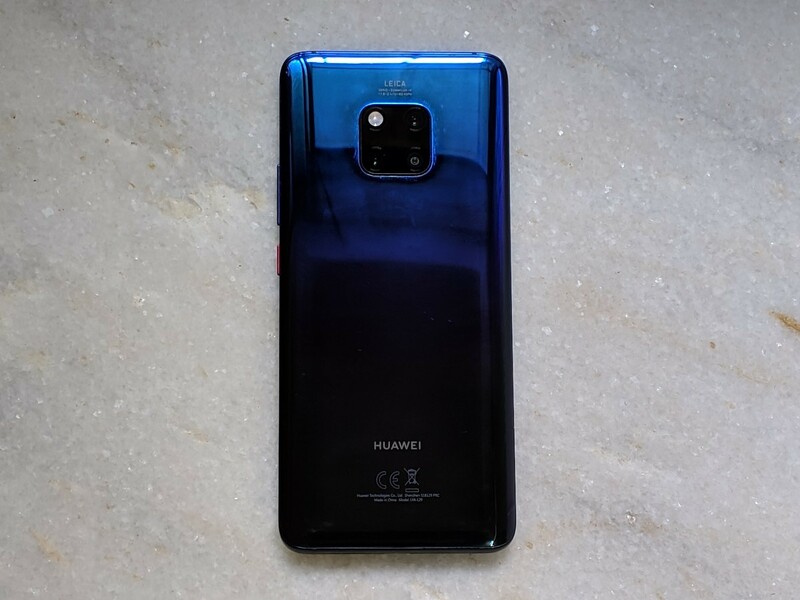 Huawei sells this phone in Twilight, Emerald Green, Emerald Blue, and Black. In India, Huawei opted to bring only the Twilight and Emerald Green colors. The Emerald Green and Emerald Blue colors have a vinyl-like coating and a different texture, but I couldn’t test this as I have the Twilight color for review. 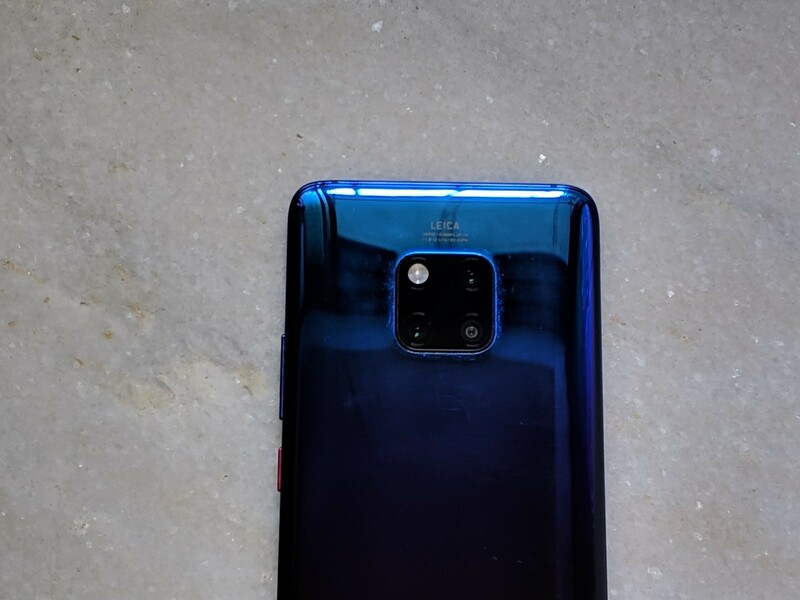 The Twilight color has a three-color (blue, purple, and black) gradient design, which is commonplace these days but was pioneered by Huawei itself. I’m not a great fan of gradient color schemes, but it’s undeniable that they do make the Mate 20 Pro stand out in a crowded sea of phones. The phone’s design is certainly not understated. If users need a color that stands out less, they can go with the Emerald Green variant. In terms of texture, the Twilight color has the standard glossy finish which attracts a lot of fingerprints. The finish also results in the phone being incredibly slippery, which is not a surprise. 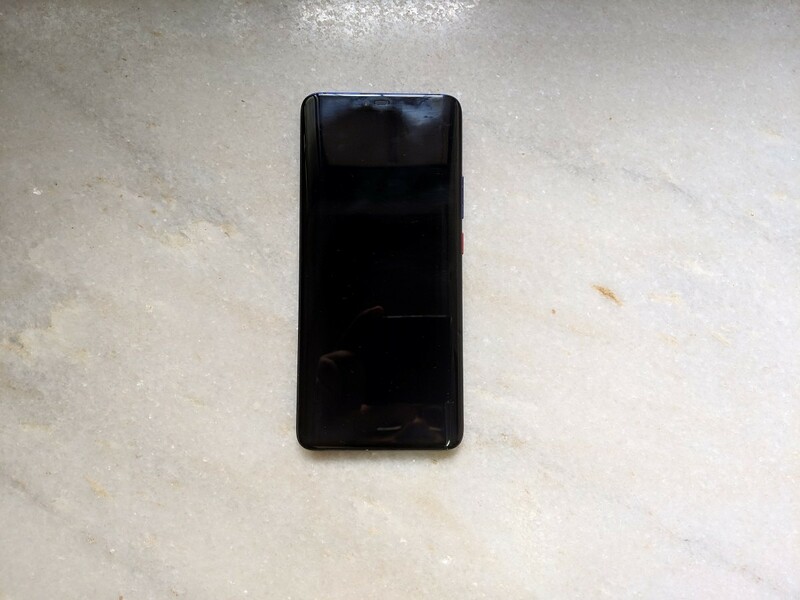 It would be nice if Huawei could make matte-finish glass back variants of its phones in the future to eliminate these issues, as we have already seen matte-finish glass make a name for itself on the Pixel 3 XL, OnePlus 6T, and LG V40 ThinQ. The triple camera setup is laid out prominently at the center on the back inside a square camera module. I worry that it makes the phone stand out a bit too much. On the positive side, the camera bump here is negligible despite the presence of the huge 40MP 1/1.7-inch sensor, which is good to see. The Huawei Mate 20 Pro has an IP68 rating for water resistance, up from the IP67 rating of the Huawei P20 Pro. In terms of ergonomics, the Huawei Mate 20 Pro is one of the best feeling phones I have ever used. Build quality is competitive with its major competitors. Despite having a tall 19.5:9 display, the phone fits easily in the hand. The curved sides make the phone appear to be thinner than it actually is, and the curved back also helps a lot here. The only arguably negative feature here is the glossy finish of the glass back. Ultimately, it’s hard to argue with Huawei’s design efforts, as the company is going from strength to strength in this area. The box package of the phone contains a 40W Huawei SuperCharge 2.0 charger, a transparent TPU case, a 3.5mm-to-USB Type-C adapter for wired audio, and Huawei’s digital USB Type-C on-ear earphones. The 15W wireless charger is sold separately in India for ₹3,999 ($57). The Huawei Mate 20 Pro has a 6.39-inch Quad HD+ (3120×1440) OLED display with a 19.5:9 aspect ratio. The display’s dimensions are 147 mm x 68 mm. Huawei sources the display alternately from LG Display and BOE Display. It should be noted that some LG Display panels on the phone have suffered from green tint issues. The panel has LG’s DDIC, while the BOE Display panel uses a DDIC supplied by Synaptics. The Mate 20 Pro unit I have has the BOE display with Synaptics DDIC. The panel itself may not be able to compete with the Samsung Galaxy S10’s Dynamic AMOLED HDR10+ display in every respect, but it’s no slouch in its own right. By default, the display’s resolution is set to Full HD+ (2340×1080), but it can be increased to Quad HD+ (3120×1440). Increasing the display resolution increases the display’s effective pixel density from 403 to 538 PPI, which means per-inch sharpness is increased by over a third. Huawei’s text rendering in EMUI 9 has noticeably improved as even Full HD+ resolution is fine to my eyes (despite the fact that the display uses a PenTile matrix). Increasing the resolution to Quad HD+ does make text appreciably sharper, though. The Huawei Mate 20 Pro’s display presents no issues with respect to brightness. Manually, the display’s brightness can go up to 400+ nits. The display also has an active High Brightness Mode (HBM) which enables it to automatically boost brightness in sunlight up to 550+ nits for an indefinite time period. This means that sunlight legibility is a major strength of the display. 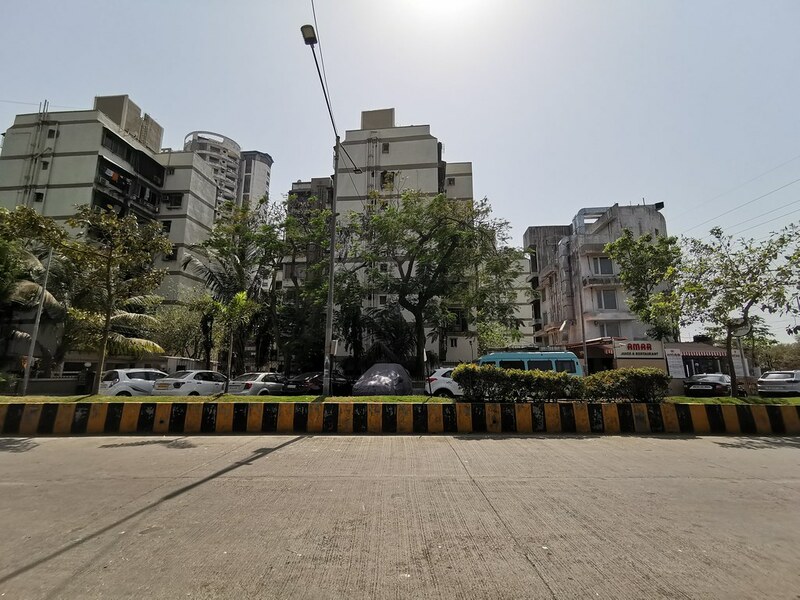 Even under direct sunlight in Mumbai, I had no issues with readability on the Huawei Mate 20 Pro. The display also doesn’t suffer from a CABC (Content Adaptive Brightness Control) issue of automatically decreasing brightness across the system UI and user apps when using manual brightness. This issue was something I had observed in EMUI 8.1 on the Huawei P20 Pro. (The EMUI 9 update fixes the issue on the older Huawei flagship as well). As the display is an OLED panel, contrast is theoretically infinite. Black crush is also not a significant issue, even though it may not be able to match Samsung’s flagship displays in this area. On the other hand, viewing angles of the BOE Display panel are phenomenal. There is a negligible angular color shift, and brightness doesn’t degrade across changes in angles. The display easily outperforms cheaper Samsung-sourced AMOLED panels in this respect. When it comes to color accuracy, a few things should be noted. Firstly, the Huawei Mate 20 Pro’s display doesn’t support Android’s native color management system. (Some competitors such as the Google Pixel 3 and Samsung Galaxy S10 do support this.) Out of the box, the display shows inaccurate colors with respect to the sRGB gamut, as the default color mode is Vivid mode. Vivid mode is calibrated to the DCI-P3 D65 gamut, albeit with a noticeably bluish white point. The white point can be corrected by choosing the Warm color temperature mode. The lack of color management means that Vivid mode is only suited for viewing DCI-P3 content, and not for viewing sRGB content. The Normal mode with Default color temperature, on the other hand, is calibrated to the sRGB gamut. Grayscale, saturation and gamut coverage are all on point. The white point is close to 6504K, and as a result, the Normal color mode satisfies color accuracy concerns. In the future, Huawei should make this the default mode, and add support for color management to handle DCI-P3 content. The Huawei Mate 20 Pro’s display supports HDR10 content. It also has a Natural Tone feature that competes with Apple’s True Tone feature on the iPhone XS. Natural Tone calibrates the display’s white point according to ambient light temperature. In my testing, this works well, but it does have the expected effect of reducing white point color accuracy. The wide display notch is quite distracting, much more so than the notch of the Huawei P20 Pro. Notification icons get reduced in number, and unfortunately, there is nothing we can do about it. Huawei does provide an excellent implementation of the notch hiding feature that adds the proper corner radii of the artificial rounded corners. Quite a few device makers fail to match the corner radii when it comes to adding rounded corners, so it’s good to see Huawei not making such a mistake. Overall, the Huawei Mate 20 Pro’s BOE Display panel is fantastic. It has a few minor issues related to the lack of support for Android’s color management system and the bluish white point of the Vivid mode, but there is not much to complain about. Note that the LG Display panel can have different panel characteristics. Unfortunately, buyers have to deal with different components in this key area. The Huawei Mate 20 Pro is powered by Huawei’s own HiSilicon Kirin 980 SoC. After two relatively lackluster generations of SoCs with the Kirin 960 and the Kirin 970, HiSilicon has bounced back with the Kirin 980. The chipset has a 2+2+4 CPU core arrangement, making use of Arm’s DynamIQ. The chipset has four Arm Cortex-A76 cores, two of which are clocked at 2.6GHz. They act as the “big” cores. Two Cortex-A76 cores clocked at 1.92GHz act as the “medium” cores. Finally, four Arm Cortex-A55 cores clocked at 1.8GHz act as the “little” cores. The SoC features Arm’s Mali-G76MP10 GPU, which is also used in the Exynos 9820 (although the Exynos 9820 uses a wider 12-core version of the GPU). Things are rounded off by dual Neural Processing Units (NPUs), the IP for which has been provided by Cambricon. Despite the presence of dual NPUs on the Kirin 980, Qualcomm still states that the Snapdragon 855’s AI Engine is more than twice as fast as Huawei’s offering when it comes to AI performance. The jury is still out among experts as to how to test this performance aspect properly. The Kirin 980 is fabricated on TSMC’s 7nm FinFET process, same as the Qualcomm Snapdragon 855. This also means that it has an efficiency advantage over the Exynos 9820, which is manufactured on Samsung’s 8nm LPP process. When it comes to CPU performance, the Huawei Mate 20 Pro (and by extension, all Kirin 980-powered phones) is in a great place. The Cortex-A76 cores are a significant generational upgrade over the Cortex-A75, which Huawei skipped entirely. The A76 cores are two-generations newer than the A73 cores featured in the Kirin 970. It’s worth noting that the A75 was said by Arm to have a 34% performance improvement over the A73 in Geekbench, while the A76 was said to feature a 35% performance improvement over the A75 in the same benchmark. Therefore, even when compared against 2019 SoCs such as the Snapdragon 855 and the Exynos 9820, the Kirin 980 is well set to compete. The weak link in HiSilicon’s SoCs has been the GPU, with the Kirin 960 and the Kirin 970 being prime examples here. The Kirin 980 features a much improved Mali-G76MP10 GPU which still, unfortunately, falls behind the Adreno 630 in the Qualcomm Snapdragon 845, to say nothing of the improved Adreno 640 in the Snapdragon 855. We turn to a set of system, CPU, and storage benchmarks. Note that all benchmarks were run with Performance mode enabled. Let’s start with PCMark, which is an industry standard system performance benchmark. PCMark holistically tests performance across common use cases such as web browsing, photo editing, writing, and more using a range of Android APIs. For example, the Writing 2.0 test uses the AndroidEditText view and the PDFDocument APIs. It measures the time to open, edit and save a PDF document. 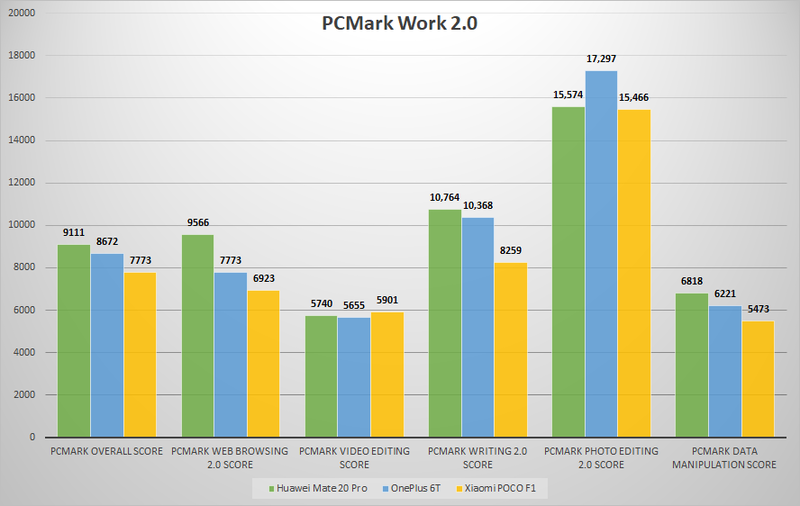 The PCMark Work 2.0 performance figure for the Mate 20 Pro is chart-topping. It’s better than the OnePlus 6T and substantially ahead of the Xiaomi POCO F1, two high performing Snapdragon 845 phones. The Web Browsing 2.0 test shows the Huawei Mate 20 Pro to outperform all of its competitors. This is impressive in itself. In the Video Editing test, most devices are separated by very small margins. The Mate 20 Pro still performs respectably here. It’s ahead of the OnePlus 6T and behind the POCO F1. The Huawei Mate 20 Pro falls behind the OnePlus 6T in the Photo Editing 2.0 test and manages to post a slightly higher score than the POCO F1. The Writing 2.0 test is currently the most important part of PCMark. The Huawei Mate 20 Pro is at the top of the charts here, slightly ahead of the OnePlus 6T and significantly ahead of the POCO F1. The Data Manipulation score behaves similarly to the Video Editing test as all competitors are spaced out closely. The Mate 20 Pro beats both the OnePlus 6T and the POCO F1 to claim the first position. Judging by benchmark results posted online, the Huawei Mate 20 Pro outperforms the Exynos 9820 variant of the Samsung Galaxy S10 in PCMark. The Qualcomm Snapdragon 855 variant of the Samsung Galaxy S10, however, is neck-to-neck in most benchmarks. The Google Pixel 3—generally hailed to be one of the top performing Qualcomm Snapdragon 845 phones—posts a slightly lower overall score than the Huawei Mate 20 Pro. In the Android world, the Cortex-A76 cores are currently the best CPU cores on the market, which means the Kirin 980 finds itself at the top of the chart. (The Qualcomm Snapdragon 855 also uses A76-derivative cores.) 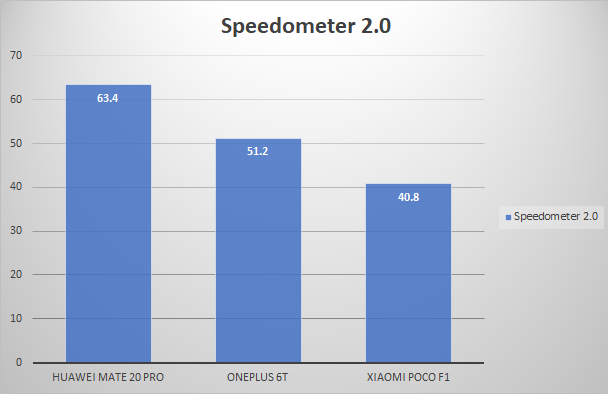 The Huawei Mate 20 Pro’s score in Speedometer represents a significant generational jump over Cortex-A75 derivative Snapdragon 845-powered phones. Geekbench is not a test of system performance, but it’s a good synthetic test of the Kirin 980’s CPU performance. The Kirin 980 easily outperforms the Snapdragon 845 in both single-core and multi-core scores. Relative to the Qualcomm Snapdragon 855, the Kirin 980 is slightly behind in single-core but falls behind significantly in the multi-threaded score. The Huawei Mate 20 Pro’s storage consists of 128GB UFS 2.1 NAND. AndroBench results are better than most 2018/2019 flagships, particularly with respect to sequential reads and random writes, where Huawei’s storage solution seems to be best-in-class at this point in time. The speeds are shown in the screenshot. Huawei’s phones are known for having excellent real-world performance, and the Mate 20 Pro is no different in this area. Scrolling performance is excellent, as scrolling through long lists and web pages on Chrome presents no issues. I also have no complaints with touch and scrolling latency. Heavy-hitting tasks on Android, such as updating multiple apps on the Play Store at once, navigating the Play Store’s app listing pages, or navigating Google Maps can bring even flagship phones to the point of stutters and dropped frames. The Huawei Mate 20 Pro, however, passes such tests with flying colors. In terms of real-world UI performance, the Mate 20 Pro does manage to distinguish itself from Qualcomm Snapdragon 845-powered flagships such as the OnePlus 6T, the Google Pixel 3, and the POCO F1. While the OnePlus 6T and the Google Pixel 3 are able to strongly compete in terms of smoothness, they fall slightly behind the Huawei Mate 20 Pro when it comes to app launch times. Launching apps is so fast on the Huawei Mate 20 Pro that it’s almost unbelievable. Affordable flagships like the Xiaomi POCO F1 are somewhat behind in terms of smoothness. It remains to be seen how well Qualcomm Snapdragon 855-powered flagships behave in this area. The Huawei Mate 20 Pro’s frame drops across the system UI and even across third-party apps are negligible. This is also the section where we discuss the phone’s unlocking speed. To put it simply, the Mate 20 Pro’s optical in-display fingerprint sensor is a major downgrade from the Huawei P20 Pro’s physical capacitive fingerprint sensor, which was the fastest fingerprint sensor I have ever used. The Huawei Mate 20 Pro’s sensor is slower to unlock, requires more pressure, and is significantly less accurate. The sensor is not always-on, which is another issue to deal with as users have to move the phone for the fingerprint sensor icon to be shown on the display. As the sensor is an optical one, it also requires light. The last two constraints discussed above don’t apply to an ultrasonic in-display fingerprint sensor, which is used in the Samsung Galaxy S10. The accuracy rate for the Huawei Mate 20 Pro’s on-screen fingerprint sensor is around 70-75% whereas it should be around 99%. In terms of the overall experience, it is very similar to the in-display optical sensor found in the OnePlus 6T, as all of these sensors are roughly in the same generation. Huawei will hopefully include a better sensor in the P30 Pro. 3D facial recognition, on the other hand, is an entirely different story. It’s able to compete with and even beat Apple’s Face ID tech on the latest iPhones. Huawei provides an option to directly unlock the phone after successful recognition of a user’s phone, which makes it superior to Apple’s Face ID. Huawei also provides another option to allow the phone to unlock even when the user has their eyes closed, although the company warns that this option is less secure. On the Huawei Mate 20 Pro, 3D facial recognition works very well. There are no problems unlocking the phone in the dark. The accuracy rate of the technology is around 99%, which is impressive. While it may not be as convenient as a back-mounted capacitive fingerprint sensor, the Huawei Mate 20 Pro’s implementation of 3D face unlock is superior to its optical in-display fingerprint sensor. The wide display notch is arguably worth it just to have this seamless implementation of secure face unlock. Users just have to press the power button, point the phone at their face, and it will unlock virtually instantly. While I’m sad about the removal of the physical fingerprint sensor, 3D face unlock is a good substitute. RAM management on Huawei phones has been a traditional issue, as the company has a default policy of aggressively killing apps in the background. However, I didn’t face any issues with apps being closed or any wonky behavior on my 6GB RAM variant of the Huawei Mate 20 Pro. Users can have multiple apps, web browser tabs, and services open in the background simultaneously. If an app does keep getting killed in the background, Huawei provides an option to manage its app launch manually, which will let it run in the background without being killed. The Huawei Mate 20 Pro’s thermals are also not an issue. Ultimately, real-world performance is a strength of the Huawei Mate 20 Pro, and it will continue to be a strength even after more Qualcomm Snapdragon 855-powered phones arrive in the market. Huawei also uses “AI-based features” in EMUI 9 that are said to help keep the phone running smoothly, but I can only comment on this after using the phone for a longer period. 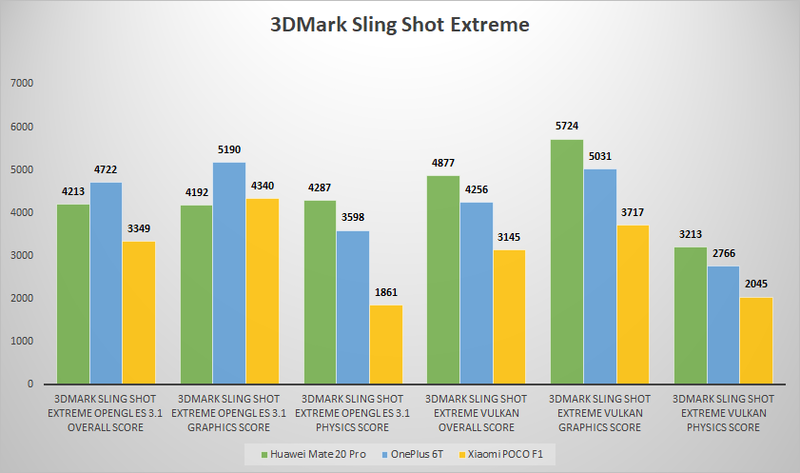 In 3DMark Sling Shot Extreme, we find the Mate 20 Pro outperforming the POCO F1 and getting outperformed by the OnePlus 6T in the OpenGL ES 3.1 version of the benchmark. The graphics score is lower than both the OnePlus 6T and the POCO F1, while the physics score is higher than both of them. In the Vulkan version of the benchmark, the Huawei Mate 20 Pro interestingly outperforms both of its competitors in all three scores. However, 3DMark doesn’t tell the whole story. GFXBench 5.0 results posted by users show that the Mali-G76MP10 GPU is slightly slower than the Snapdragon 845’s Adreno 630 GPU, which in turn is 20% slower than the Qualcomm Snapdragon 855. The Exynos 9820’s Mali-G76MP12 GPU is also faster than the Mate 20 Pro’s GPU. When compared against the last-generation Exynos 9810’s Mali-G72MP18, the Huawei Mate 20 Pro goes up ahead. Of course, peak GPU performance in synthetic benchmarks is not equal to real-world gaming performance. We have already seen the Kirin 980 on the Honor View 20 do a brilliant job when it comes to playing games. The Mate 20 Pro should be able to achieve the same performance, so buyers don’t have much to worry about here. It’s more a case of future-proofing, as it’s undeniable that the Mate 20 Pro’s GPU is slower than even affordable flagships such as the POCO F1, and the gulf will only widen when the Qualcomm Snapdragon 855 makes its way to lower price points. The Huawei Mate 20 Pro has a triple rear camera setup, which is branded the Leica Triple Camera. (The optics are sourced from Leica.) The primary sensor is the 40MP Sony IMX600, which has a 1/1.7-inch sensor size, 1.0μm pixel size, f/1.8 aperture, and 27mm equivalent focal length. It does not have OIS. The secondary camera is an 8MP sensor with a 1/4-inch sensor size, OIS, f/2.4 aperture, and an 80mm focal length. This lets it provide nearly 3x optical (lossless) zoom relative to the 27mm focal length of the primary camera, and it also has a 5x hybrid zoom option. While the Huawei P20 Pro had a 20MP monochrome tertiary camera, the Huawei Mate 20 Pro retires it in favor of a brand new 20MP ultra-wide angle camera. The ultra-wide angle sensor has an f/2.2 aperture, 16mm focal length, and autofocus (!). Autofocus has traditionally been missing in ultra-wide angle cameras (as seen on LG’s flagships and the Samsung Galaxy S10), so the Huawei Mate 20 Pro positively distinguishes itself in this respect. The Huawei Mate 20 Pro’s 40MP primary sensor is the same as the Huawei P20 Pro’s primary sensor. It uses a Quad Bayer filter instead of a standard Bayer filter, which means that it has less color resolution in comparison to smartphone cameras that use standard Bayer filters. The camera uses 4-in-1 pixel binning to effectively have 2.0μm super pixels with 10MP resolution (which is the default resolution). Pixel binning is used to reduce noise, increase dynamic range, and improve per-pixel detail. All three cameras use Huawei AI Image Stabilization (AIS). AIS is the technology that allows Huawei’s night mode to be used without a tripod. The Leica Triple Camera setup features 4D autofocus (contrast detection, phase detection, laser, and depth detection). Having all three cameras with different focal lengths enables flexibility on an unprecedented level (unlike the Nokia 9 PureView’s penta-camera setup, which follows a different imaging philosophy). The 16mm ultra-wide-angle has 0.6x the focal length of the primary camera, while the 8MP telephoto camera enables 3x optical zoom and 5x optical zoom. Despite not having an interchangeable lens camera, the Huawei Mate 20 Pro achieves the same goals by using different means. It’s truly impressive to think of. The monochrome camera won’t be missed too much, as Huawei’s low light capabilities have increasingly been driven by pixel binning and AIS, instead of being driven by monochrome cameras. It should be noted here that the telephoto camera has an 8MP resolution, but photos taken by it actually have a 10MP resolution because they combine the output of both the telephoto and the primary cameras. Last year, Huawei’s 40MP sensor was unique. This year, however, Sony’s IMX586 48MP 1/2″ sensor has achieved significant popularity, finding its way in the Honor View 20, Xiaomi Mi 9, and even the Xiaomi Redmi Note 7 Pro. The fundamental approach is the same, as it uses 4-in-1 pixel binning with 12MP resolution to achieve 1.6μm super pixels from the 0.8μm pixel size. This sensor is newer than the IMX600, and it can be expected to find its way to other phones as well. We expect Huawei to use a 40MP sensor in the P30 Pro, however. The Huawei Mate 20 Pro’s camera app is mildly improved from the Huawei P20 Pro’s camera app. The camera modes visible on the main screen are Photo, Video, Portrait, Aperture, Night, and Pro. The remaining modes are Slow-mo, Panorama, Monochrome, AR lens, Light painting, HDR, Time-lapse, Filter, 3D panorama, Watermark, Documents, Underwater, and Super macro. Users can also enable Moving Pictures, which is Huawei’s take on Google’s Motion Photos and Apple’s Live Photos. Most of the camera modes are self-explanatory. The slow-motion mode allows users to record 720p video at 960fps for 0.2 seconds. This is not real 960fps video, though, as the Huawei Mate 20 Pro’s sensor doesn’t have a DRAM die, unlike the Samsung Galaxy S10. Instead, it uses software interpolation. The final result still looks good as long as there is plenty of light. The Night mode uses handheld long exposures. It takes 4-5 seconds to take multiple exposures and then stacks them together, using AIS to minimize motion blur and camera shake. We will assess it in the image quality section. The Super macro mode is interesting, however. It allows users to take photos of close-range objects going as low as 2.5 cm. As far as I can tell, this is a unique feature in the smartphone market, and it works remarkably well. The Huawei Mate 20 Pro uses its speedy Kirin 980 chipset to get a fast and smooth camera user experience. Focusing is fast and accurate. Taking photos is fast. Shutter lag is tangibly less than the Huawei P20 Pro, and I assume this is because of the significant improvements in processing power. In low light, there is still no “zero shutter lag” mode similar to “HDR+ on” mode in Google Camera, but the trade-off in better image quality is worth it across the board. The “Sharpening the photo… Please steady your device” message now appears only in low lighting conditions, which is how it should be. The camera preview also maintains a high frame rate, although I do wish that it had a higher resolution. I also wish that it would be more representative of the final photo in terms of lighting. Master AI, first introduced in the Huawei P20 Pro, returns on the Huawei Mate 20 Pro. It can now recognize more scenes and objects. Huawei has significantly improved the performance of Master AI, to the point where I recommend leaving it switched on. The “Blue Sky” and “Greenery” scene modes are significantly toned down in terms of saturation and exposure, and over-saturation of colors is not an issue anymore. It can still misidentify scenes, but the frequency of this issue has gone down. Master AI now also hurries up when it comes to switching between scenes. The chances of a photo being taken in the wrong scene mode are lower now. All these improvements have to be commended. As before, Master AI can also be entirely disabled. Once it’s disabled, there will be a significant impact on image quality, and it will probably be negative in terms of dynamic range and exposure. Huawei, therefore, is on the right track, and only a few trifling issues are left to be solved with respect to user experience. Methodology: All photos were taken handheld in either Photo or Night modes with Master AI enabled. All indoor and low light samples have 10MP resolution. Most daylight samples also have 10MP resolution. 40MP full-resolution samples are separately shown in a different gallery. Samples taken with the telephoto and ultra-wide angle cameras are also shown separately. The Huawei Mate 20 Pro is a star performer in daylight when taking photos with the primary camera at the default 10MP resolution. Photos have superb exposure, accurate colors, and class-leading dynamic range. Huawei continues to lag slightly behind in terms of detail retention, however. I believe that this is a conscious design that was taken by the Huawei imaging team to completely eliminate noise. In daylight, image samples have no noise at all in most cases at the starting ISO level. Shutter speeds are up to the mark as well, which means that the camera can be used for capturing fast moving objects under natural light. I also believe, however, that the decision to have slightly less fine detail in favor of completely eliminating noise is a misguided one. The Google Pixel 3’s Google Camera software (and by extension, any phone with a properly working unofficial Google Camera port) follows precisely the opposite approach, and as a result, its 12MP photos have more detail even as it can’t compete in terms of exposure (the Google Pixel’s photos are predominantly underexposed.) The Google Pixel opts to let luminance noise remain even in daylight photos to retain a higher amount of fine texture detail in natural objects such as trees, plants, grass, etc. Both approaches have their pros and cons, but the Google Pixel’s approach is better for me. Dynamic range, on the other hand, is a different story. The Huawei Mate 20 Pro’s 10MP photos have the best dynamic range I have seen on a smartphone camera so far. The Google Pixel 3 can’t really compete here (despite Google Camera’s workflow prioritizing dynamic range) due to its loss of exposure. Other phones like the Samsung Galaxy S10, Xiaomi Mi Mix 3, OnePlus 6T, and others are able to expose scenes better, but their dynamic range is still far behind the Huawei Mate 20 Pro’s dynamic range. The Huawei Mate 20 Pro’s dynamic range is so good that photos of scenes such as sunrise and sunset are handled properly, with just the right amount of tone and color detail thanks to Master AI’s help. The Mate 20 Pro’s 10MP photos have the best dynamic range I have seen on a smartphone camera so far. The dynamic range advantage means that photos of high-contrast scenes are no problem for the Huawei Mate 20 Pro’s camera. The issues of image processing artifacts and corner softness are also nowhere to be seen. Thanks to the superb exposure (although some samples do suffer from overexposure), accurate colors, and excellent dynamic range, the Huawei Mate 20 Pro’s photos have the highest chances of producing a “wow effect,” which is a socially-beneficial technical achievement. Can the slightly inferior fine detail issue in 10MP samples be solved by taking photos in 40MP resolution? The answer to that question is nuanced in nature. 40MP samples taken in daylight do have more detail in most cases than the 10MP pixel binned samples, although this is not always the case. Using the 40MP resolution option presents its fair share of caveats, though. The first is file size, which isn’t a trifling issue on its own. The second is that in 40MP mode, all zoom options are disabled—users have to jump back to the 10MP option in order to use the ultra-wide angle and telephoto cameras. 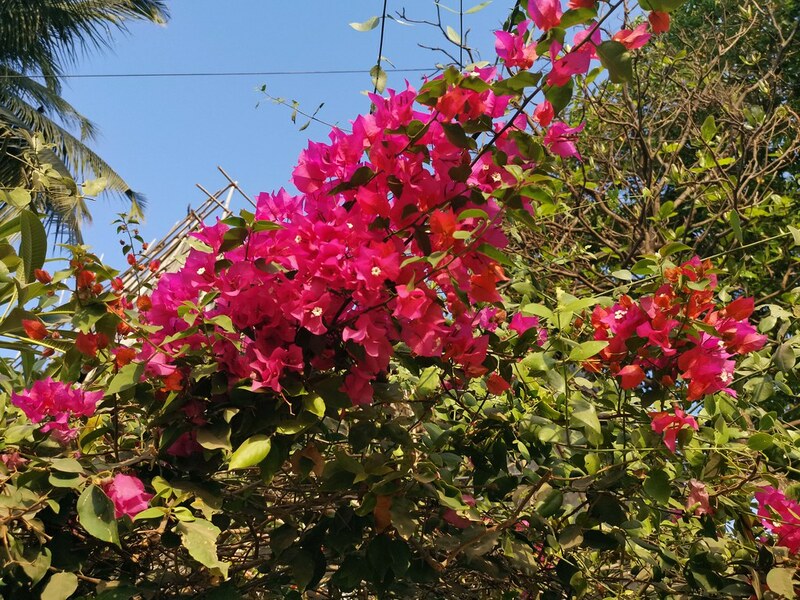 The third—and the most serious—issue is the fact that the 40MP samples have a dramatic deficit in dynamic range and exposure, losing the wow-factor of the Mate 20 Pro’s camera. Without pixel binning, dynamic range and exposure become disadvantages for the Mate 20 Pro’s camera in 40MP mode. Most samples come out underexposed. 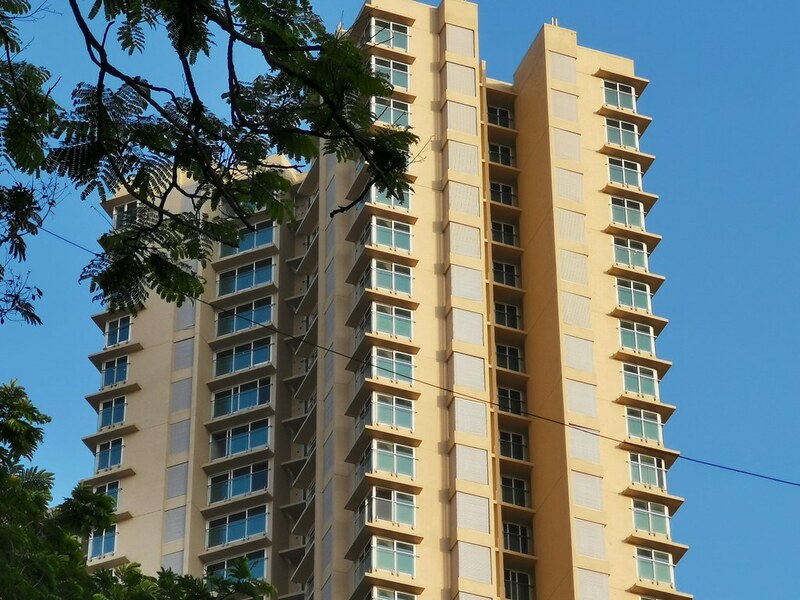 Dynamic range is lost to the point where most competing flagships manage to outperform the Huawei Mate 20 Pro’s 40MP mode in this area. 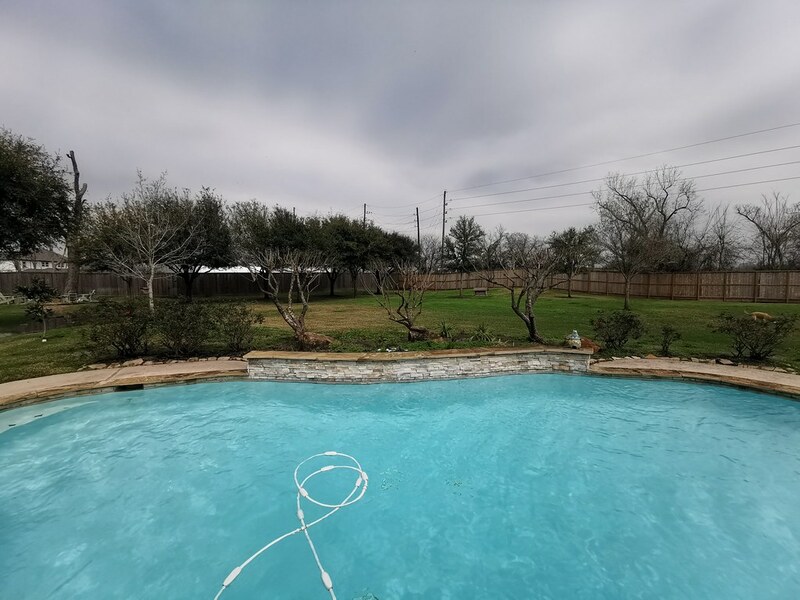 When taking these factors into consideration alongside the fact that the advantage in detail is not enough to mitigate these negatives, we arrive at one recommendation: Use the 10MP resolution option in nearly all cases, even in daylight. The Honor View 20 has an AI Ultra Clarity mode which takes multiple 48MP exposures over the course of 4-5 seconds and then stacks them together for a sharper, more detailed photo. Huawei hasn’t given such a capability to the Mate 20 Pro yet. The portrait and aperture modes on the Mate 20 Pro are good, but their caveats should be kept in mind. Beautification should be turned off immediately, but even after turning it off, portrait mode samples taken indoors have less detail than standard photos. Portrait mode is still good enough for taking photos of people when there is enough light, but I’m more impressed by the aperture mode. This enables users to take photos of objects with the bokeh effect, and as such, it proves useful in product photos. The level of bokeh can also be chosen from f/0.95 all the way to f/16. Huawei’s telephoto camera on the P20 Pro was notable in 2018 for providing unparalleled 3x optical zoom and 5x hybrid zoom. It’s now March 2019, and yet, the Huawei Mate 20 Pro (which has the same telephoto sensor as the P20 Pro) retains a competitive advantage in this respect. 10x zoom cameras are on the horizon (with Huawei’s own P30 Pro being reported to have such capability). While the Samsung Galaxy S10, Xiaomi Mi 9, and the LG V40 ThinQ/LG G8 ThinQ have 2x zoom telephoto cameras, the Huawei Mate 20 Pro has a 3x zoom telephoto camera. The image quality from the telephoto camera remains as good as ever in daylight. The framing opportunities provided by a telephoto camera make its inclusion worth it. The capability of an 80mm equivalent lens shouldn’t be underestimated, and even 5x hybrid zoom samples have good image quality. It can also be noted here that despite Google’s efforts, Super Res Zoom on the Google Pixel 3 falls behind Huawei’s 3x optical zoom on the Mate 20 Pro in terms of detail retention. Let’s move on to the ultra-wide angle camera. The 20MP camera lives up to its potential. 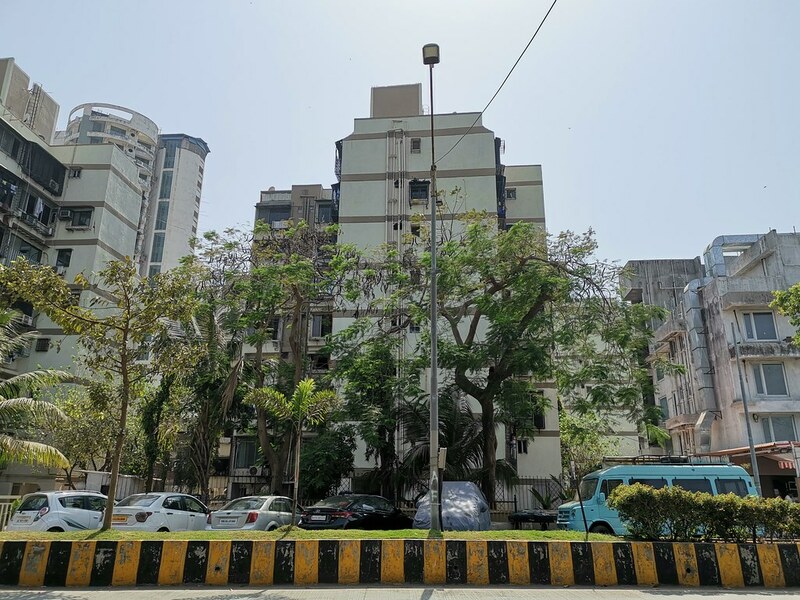 It’s more or less the only game in town, as LG’s ultra-wide angle camera on the LG V40 ThinQ suffers from poor image processing and lack of autofocus. The ultra-wide angle sensor on the Samsung Galaxy S10 seems to be significantly better, but it suffers from distortion due to its 123-degree field-of-view. The Huawei Mate 20 Pro’s ultra-wide angle camera, on the other hand, has none of these problems. In daylight, it takes superb photos with well-defined detail, good exposure, and slightly saturated colors. The inclusion of autofocus means that every photo won’t have to be taken with focus set to infinity. The 16mm focal length means that the coverage of the ultra-wide angle sensor is less than the Samsung Galaxy S10’s ultra-wide angle sensor, for example. The downside is that you get fewer objects in the frame. The upside is that the chances of distortion are much lower. Here are some additional image samples that were taken by XDA Contributors Eric Hulse and Max Weinbach in the U.S. They showcase the same great characteristics of excellent exposure and dynamic range. Overall, the Huawei Mate 20 Pro is one of the best smartphone cameras when it comes to taking photos in daylight. Three different cameras with three different focal lengths provide flexibility in composition. Image quality from the telephoto camera continues to be a step above the competition. The ultra-wide angle sensor’s output is also better than its major competitors. With respect to the primary camera, its pixel binned 10MP photos are outstanding in every single aspect except for detail retention, where it cedes the top spot in favor of a place in the top tier of smartphone cameras. As we move indoors, the Huawei Mate 20 Pro’s camera strengths are still highlighted. However, the reduction in light levels also brings forth the major weak point of the Mate 20 Pro’s image processing. The camera opts to reduce noise too much, which has a negative effect of reducing fine detail. This is apparent when taking photos of people under artificial light. Skin tones are artificially processed, making them look inauthentic. In stark contrast, the Google Camera HDR+ software of the Google Pixel 3 reproduces such detail faithfully, and the Google Pixel’s photos are sharper indoors as long as there is enough artificial light. The Huawei Mate 20 Pro still performs well indoors, but the noise reduction issue was something that I had highlighted back in the Huawei P20 Pro’s review, and it still hasn’t been solved here. Fine texture detail is deteriorated to the point where the Huawei Mate 20 Pro gets demoted to second position behind the Google Pixel 3. It’s still a better camera indoors than phones like the OnePlus 6T, LG V40, Vivo NEX S, and POCO F1. The Samsung Galaxy S10 will also probably fall behind here. Overall, Huawei needs to improve its noise reduction algorithm indoors to let luminance noise remain in favor of retaining more detail. Such an approach would probably make the Huawei Mate 20 Pro a best-in-class indoor smartphone camera considering its strengths in terms of light capture and dynamic range. As it is, it remains in the top tier. Over the last year, Huawei has become known as a photography leader, especially in low light. The company was the first to popularize the computational photography-powered night mode. This feature has now become so popular that variations of it are offered by Google (Night Sight), Xiaomi (Super Night Scene), Samsung (Bright Night in Scene Optimizer), OnePlus (Nightscape), LG (Super Bright Mode), and even Realme (Nightscape). 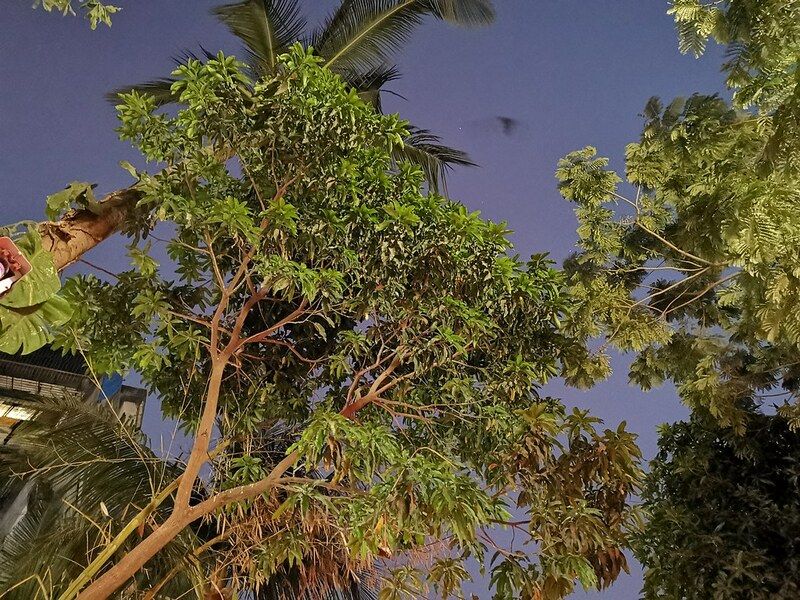 The Mate 20 Pro retains Huawei’s night mode, which seems to be largely unchanged from its implementation on the Huawei P20 Pro. Some may expect the Mate 20 Pro to perform worse than the P20 Pro due to the absence of the monochrome camera, but that isn’t actually the case. In low light, the Mate 20 Pro uses 4-in-1 pixel binning, high ISOs, and long exposures in Photo mode to take fantastic photos. The samples that are taken in Photo mode are better than the Google Pixel 3’s HDR+ photos, as well as the Samsung Galaxy S10’s low light photos. This is because Huawei is willing to push ISO as high as ISO 102,400 automatically, with shutter speeds going as low as 1/17s even with the lack of OIS. ISO 102,400 can even be manually chosen in Pro mode. In Photo (auto) mode, one of my low light samples had a sensor gain of ISO 12,800, and quite a few samples feature ISO 6,400 and ISO 4,000. Competing smartphone cameras refuse to push ISO so high, and therefore, they can’t capture so much light. The Huawei Mate 20 Pro’s low light photos show class-leading exposure, detail, color detail, and dynamic range. The photos are outstanding as Huawei manages to carefully avoid most pitfalls in low light imaging. Chromatic noise is not an issue. Luminance noise is also sparingly found in photos. The samples are not affected by processing artifacts or corner softness. The light levels captured by the Mate 20 Pro’s camera have to be seen to be believed. The light levels captured by the Mate 20 Pro’s camera have to be seen to be believed. Samples taken in Photo mode are so good that night mode is hardly necessary at times. When Master AI judges the necessity of switching to night mode, it will automatically do the job. Night mode has the same pitfalls that it had on the Huawei P20 Pro. This is to say that it’s prone to camera shake and motion blur. With the lack of OIS, camera shake becomes a significant issue, and it’s an issue that Google’s competing Night Sight doesn’t suffer from to the same extent. Huawei’s night mode also doesn’t seem to align frames as effectively as Google’s Night Sight, which means there are higher chances of motion blur. Huawei’s night mode also results in photos that have less detail than their Photo mode counterparts. The water painting effect also returns here, whereas it’s completely absent in Photo mode. Night mode, therefore, should only be used in extreme low lighting conditions when it can capture a lot more light to mitigate its negatives. Ultimately, Google’s Night Sight ends up being slightly better than Huawei’s night mode in most cases thanks to being able to retain more detail in most cases. Night Sight can also achieve brighter exposures in some cases. However, both night modes are in a league of their own right now. The Huawei Mate 20 Pro’s low light photos (whether they are taken in Photo mode or Night mode) also seem to be significantly better than the Samsung Galaxy S10’s low light photos, judging by samples posted online. The Google Pixel 3 and the Huawei Mate 20 Pro are the current low light imaging champions, and it’s a toss between the two for the overall winner. As it is, even Night Sight isn’t unquestionably better than Huawei’s low light photos. Both have their pros and cons, and it’s hard to complain about their output given the pace of improvement in this respect. The telephoto and ultra-wide angle cameras shouldn’t be used in low light, as their image quality degrades rapidly due to their poorer optics. In some cases, the Huawei Mate 20 Pro will actually use its telephoto camera in low light instead of cropping its primary camera’s output, but the f/2.4 aperture means that low light photos with the telephoto lens won’t turn out great. The LED flash of the Mate 20 Pro is powerful enough to light up pitch black surroundings, so it does its job well. Overall, the Huawei Mate 20 Pro is one of the best 2018/2019 smartphone cameras for low light photos. The Huawei Mate 20 Pro can record videos in [email protected], [email protected], and [email protected] EIS is active in all three modes. [email protected] video recording is not supported on the phone as the Kirin 980’s encoder doesn’t support it. This means there are no chances of [email protected] video recording support arriving in a future update. The Huawei P20 Pro did not support EIS in [email protected] and [email protected] videos, but the Mate 20 Pro does rectify this by enabling EIS in all three recording modes. Let’s start with [email protected] videos. They are recorded with a bitrate of 37Mbps. Audio is recorded in stereo, and I have no complaints regarding audio recording. Autofocus works well. Huawei has significantly improved its EIS system, to the point where it’s one of the best in the market. The level of stabilization is fantastic. The videos have great detail, accurate colors, and brilliant dynamic range. In low light, 4K videos see their detail levels drop substantially. However, the Huawei Mate 20 Pro still records some of the best 4K low light videos I have seen on a phone. [email protected] videos are recorded with a bitrate of 23Mbps and have a smooth, constant 60fps frame rate. There is not much to say here: EIS continues to work brilliantly. Detail levels are predictably less than 4K videos, but this mode is more suited for recording fast moving objects. In low light, 60fps videos are underexposed, as expected. Users are better off recording in [email protected] in low light instead. Finally, [email protected] videos are recorded with a bitrate of 15Mbps. They share the great characteristics of [email protected] and [email protected] videos with the exception of resolution and frame rate. Huawei’s EIS is now a strong competitor to Google’s fused video stabilization on the Pixel. In low light, [email protected] is the preferred video mode as it has the brightest exposure (although 4K videos resolve more detail). In fact, the Huawei Mate 20 Pro is a low light video recording champion because its videos share the same characteristics of its low light photos. Overall, Huawei’s efforts to improve video recording are clear to see. While the Huawei P20 Pro was disappointing when it came to recording high resolution and high frame rate video with stabilization, the Huawei Mate 20 Pro makes no such mistakes. It posts a great showing across the board. I am disappointed by the Huawei Mate 20 Pro’s speaker. The primary speaker is hidden inside the USB Type-C port, with the earpiece acting as the secondary speaker. The speaker isn’t as loud as it should be, although its clarity is fine. In terms of loudness, it is a regression from the Huawei P20 Pro’s speaker. It also gets outperformed by quite a few cheaper phones that cost 1/5th the price of the Mate 20 Pro. The Huawei Mate 20 Pro supports Dolby Atmos, which cannot be disabled in speaker mode. The story doesn’t improve when we discuss wired audio. The Huawei Mate 20 Pro doesn’t have a 3.5mm headphone jack, unlike the standard Huawei Mate 20. It’s a funny sort of situation where the “Pro” variant doesn’t have a feature that was once described as ubiquitous while the standard variant does have this feature. Huawei has done this with the Mate 10 series before, though. I have made my stand on the absence of the headphone jack well known in prior reviews, so I don’t believe there is much point in going over it again. I’ll just say this: It’s a great disappointment to see that Huawei and the rest of the Chinese vendors have followed Apple’s lead here. The Samsung Galaxy S10+’s inclusion of the 3.5mm headphone jack along with a 4,100mAh battery and an ultrasonic in-display fingerprint sensor shows what’s possible. Unfortunately, Samsung and LG are the only major vendors left selling flagship phones with 3.5mm headphone jacks. Ultimately, the Huawei Mate 20 Pro posts a rather disappointing showing in audio. It seems there is not much hope of a turnaround in this aspect with respect to 2019 flagship phones. Phones like the Samsung Galaxy S10, LG V40 ThinQ/LG G8 ThinQ, and POCO F1 are still around for now, though. Starting with the gestures, Huawei has sensibly opted not to adopt Android Pie’s gesture navigation system. Instead, the company uses its own full-screen gesture navigation system that actually saves screen estate, and the system itself is very similar to MIUI‘s gesture navigation system. 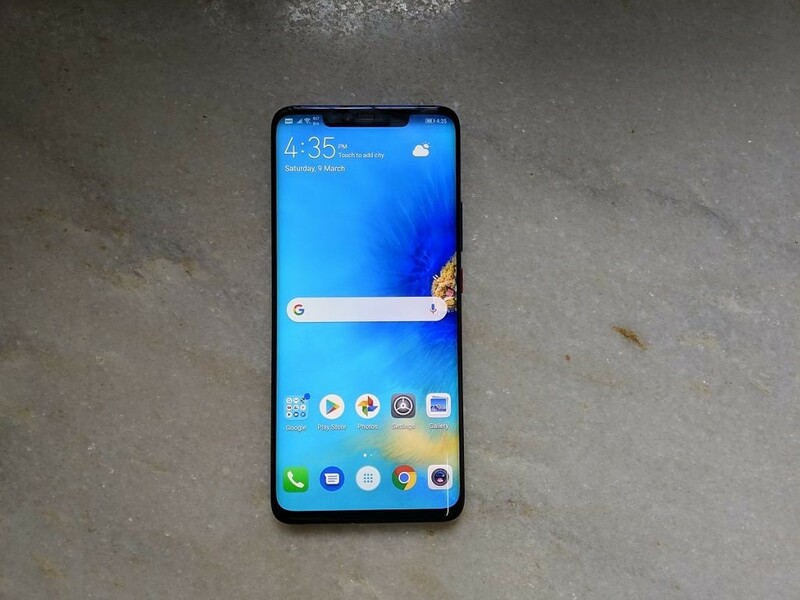 Users can swipe up from the bottom to go home, swipe from the left or right sides of the display to go back, swipe up and hold from the bottom to access recent apps, swipe up diagonally from the bottom corners to enter Huawei’s Mini Screen View, and optionally swipe up from the bottom corners to enter Google Assistant. All in all, it’s a good system, even though there is some room for improvement. I prefer MIUI’s implementation of gestures because its finger tracking is smoother. Huawei’s implementation also doesn’t work optimally if you use a third-party launcher. When the default launcher is something other than Huawei Home, users will no longer be able to swipe up from the bottom to exit the recent apps list (they will have to tap anywhere to exit it), and the animations are lost too. MIUI’s navigation system doesn’t suffer from this issue. On the other hand, mini screen view is still easily accessible on EMUI even if you use gestures, unlike MIUI, which forces the user to switch back to three-button navigation. On the global variants of the Huawei Mate 20 phones, users can change the default launcher to a third-party one, which isn’t possible on the China software. The Huawei Launcher itself is an inoffensive launcher in its own right. It’s fast and smooth, and it comes with quite a few customization options. The only thing it’s missing is a swipe up gesture to enter the app drawer. Other competitors do provide this feature, and it adds to the perception of speed and immediacy. The recent apps view is the same as stock Android Pie, but as EMUI doesn’t support Android Pie’s navigation system, users can’t quickly jump back and forth between apps. The row of suggested apps is also missing. The rest of the UI adheres closely to Material Design 1 principles. The aesthetics of the quick settings drawer have been changed from blue text on black to blue text on a white background. It’s a small change, but it makes a huge difference. The Huawei Mate 20 Pro supports always on display, but it’s disabled by default. System-wide dark mode can be enabled, and eye comfort mode is also supported with scheduling options. EMUI 9 retains support for Huawei’s Easy Projection feature, which is a competitor to Samsung’s DeX. Easy Projection can also work wirelessly on EMUI 9. It also has many more features such as Scheduled Power On/Off, App Twin, PrivateSpace, Simple Mode, Ride Mode, and more. When using three-button navigation, users can customize the number and placement of the navigation buttons. They can also choose to hide the navigation keys entirely by adding a hide navigation bar button. Huawei’s mini screen view (one-handed mode) also continues to be a welcome addition, especially as the feature still doesn’t exist in stock Android. Motion control gestures and knuckle gestures return as well. While knuckle gestures are a gimmick, motion control gestures contain simple flip, pick up, and raise to ear gestures. In particular, the flip gestures add convenience. EMUI does something called “Smart tune-up” that’s said to regularly update app configuration data to improve app performance. It also automatically cleans junk files after 14 days, according to Huawei. EMUI’s list of bloatware is non-existent, which is good to see. Huawei uses Messages as the default SMS client and Google Chrome is the only pre-installed web browser. Huawei’s system apps (such as the Calculator, Calendar, Gallery, and Phone app) are also clean, well-designed, and feature-rich. The company also has its own version of Digital Wellbeing that is called Digital Balance. Overall, EMUI 9 on the Huawei Mate 20 Pro is a polished experience. As far as third-party user interfaces go, EMUI ranks near the top in my opinion. Subjectively, I prefer it to MIUI, although stock Android’s minimalism and OxygenOS‘ perception of speed is hard to beat. A 4,200mAh battery powers the Huawei Mate 20 Pro. The battery capacity is slightly bigger than the Samsung Galaxy S10+’s 4,100mAh battery and significantly bigger than the Google Pixel 3 XL’s 3,400mAh battery. The Kirin 980 has proven to be a power efficient SoC, but on the other hand, we have a big 6.39-inch Quad HD+ OLED display. How does the Huawei Mate 20 Pro’s battery fare? The Mate 20 Pro’s run time of 6 hours and 46 minutes is almost exactly the same as the P20 Pro’s 6 hours and 31 minutes run time, which we tested last year, even though the Kirin 980 is a lot more efficient than the Kirin 970. This may have to do with higher base power consumption on the Mate 20 Pro’s BOE Display OLED panel, but this is impossible for me to test without having the required equipment. It’s worth noting that AnandTech‘s testing showed the LG Display panel of the phone to consume an abnormal amount of power, adversely affecting battery life. In my real-world use, I found the PCMark figure to be slightly above the screen-on time figures I was getting. PCMark is a mixed usage test, whereas my phone usage consists almost entirely of web browsing and a few minutes of YouTube video playback. I was able to get roughly six hours of screen-on time over an unplugged time of 36-48 hours, which is pretty good battery life in my case. The POCO F1’s battery life is slightly better with a 4,000mAh battery and the Qualcomm Snapdragon 845. The OnePlus 6T’s battery life is noticeably better despite having a smaller 3,700mAh battery, which probably points to OnePlus’ software optimizations. In terms of charging, the Huawei Mate 20 Pro has an advantage over much of the Android competition. That’s because it supports Huawei’s 40W SuperCharge 2.0 protocol, which is the successor to the first-generation 22.5W SuperCharge 1.0 standard. The SuperCharge 2.0 charger is bundled in the box, and it works amazingly well. SuperCharge 2.0 allows the phone to be charged 70% in 30 minutes, according to Huawei. My informal testing corroborates Huawei’s claims. Although SuperCharge 2.0 isn’t quite the fastest quick charging standard (that award currently belongs to OPPO’s 50W Super VOOC standard), it is nonetheless very, very quick. It’s also faster than Warp Charge 30 on the OnePlus 6T McLaren Edition. SuperCharge 2.0 also keeps thermals in check, and Huawei states that it uses 12-step safety procedures. With respect to the Samsung Galaxy S10 and the Google Pixel 3, the Mate 20 Pro leaves them far behind. Samsung’s 15W Adaptive Fast Charging is multiple years old now, while the Google Pixel 3 only supports 18W charging using USB-C Power Delivery. That’s not all, of course. The Huawei Mate 20 Pro still has more tricks up its sleeve. It supports 15W fast wireless charging, which is beaten only by the newly launched Xiaomi Mi 9 with its 20W wireless charging. In contrast, the Google Pixel 3 only supports 10W wireless charging, and that also with a “Made for Google” certified charger. Huawei sells its own 15W fast wireless charger for the Mate 20 Pro for ₹3,999 ($57) in India (for comparison, the Google Pixel 3’s Pixel Stand wireless charger is a lot more expensive at its current retail price of ₹6,649 which converts to $95). Huawei’s charger looks like a standard wireless charger, but its real strength is its speed. I personally have never needed wireless charging on a phone (it’s the height of a first world problem for me, but I acknowledge the right of others to hold their own opinions here). The Huawei Mate 20 Pro’s 15W wireless charging, however, is the first occasion where it can actually be used as a substitute to wired charging. (Although wired charging is still a lot, lot faster in this case.) The only problem with the charger? Other phones that support wireless charging will charge at a significantly slower rate, so users should keep that in mind. The final trick the Huawei Mate 20 Pro has in the charging field is reverse wireless charging. This is more of a gimmick than anything else for the use case of charging one phone using another phone’s battery. I say this because that particular case is extremely niche. However, its second use case of wirelessly charging smartwatches is a lot more compelling for smartwatch owners. It has even been adopted by Samsung in the Galaxy S10. Overall, the Huawei Mate 20 Pro’s battery life is good without being class-leading. It shows that software optimization is still more important than battery capacity. We continue to wait for phones that will give us 8-9 hours of screen-on time with heavy use, helping them last more than two days. I had no problems with cellular call quality and reception on the Huawei Mate 20 Pro. In India, the phone supports VoLTE on both Jio and Vodafone’s networks. The phone is also the first Huawei phone to feature dual-frequency GPS bands (L1+L5) for better reception. The phone’s haptic vibration motor is not as good as it should be. The Google Pixel 3 and the LG V40 ThinQ are far better in this respect. Even cheaper phones like the Xiaomi Mi A2 have stronger vibration, so Huawei has some way to go to improve things in this respect. The Huawei Mate 20 Pro’s design is good. Huawei continues to progress with gradient schemes and general look and feel. While the Mate 20 Pro doesn’t have something like the Honor View 20’s shimmering glass effect, it’s quite hard to call the Twilight color understated on its own. Build quality and ergonomics continue to be excellent. The BOE Display OLED display is superb. The display posts excellent results in all fields ranging from resolution, brightness, contrast, viewing angles, and color accuracy. The LG Display panel may have different characteristics, but the BOE Display panel is a strong contender for one of the best flagship smartphone displays. The Kirin 980 is a fast, power efficient SoC, and the Mate 20 Pro benefits from it. The SoC is more than a match for the Qualcomm Snapdragon 855 in terms of CPU and system performance, and judging from preliminary results, it’s faster than the Exynos 9820 in terms of system performance. The GPU still remains a relatively weak point in terms of peak GPU performance, but Huawei is in a much better place this year. Overall, the Kirin 980 is one of the fastest SoCs out there. The Huawei Mate 20 Pro has a superb camera that posts best-in-class results in several areas such as low light photography, ultra wide-angle sensor image quality, and dynamic range in daylight. It has no major weaknesses apart from aggressive noise reduction in indoor conditions. Video recording has also been significantly improved, to the point where it’s competitive with the best out there. In terms of audio, the Huawei Mate 20 Pro doesn’t manage to inspire in any way. The speaker is quiet, and the decision to remove the 3.5mm headphone jack is still a remarkably poor one. The phone does support USB Type-C analog audio, which is one redeeming factor. EMUI 9 is much improved from its past iterations. The added features it provides are a good differentiating factor relative to stock Android. EMUI is simple, fast, and smooth on the Mate 20 Pro, and I genuinely like the full-screen navigation gestures. The battery life of the Mate 20 Pro may not be class-leading, but it’s still good enough. I feel that there is more potential left in the 4,200mAh battery, but as it is, the battery life is currently in the upper tier of flagship phones. In terms of charging, the Huawei Mate 20 Pro runs rings around the Galaxy S10 and the Pixel 3, and it really has few competitors in general. The 40W SuperCharge 2.0 standard is amazing, there is no doubt about it. 15W fast wireless charging is also a nice bonus. When we arrive at the development section… Unfortunately, there is no development section to speak of. The bootloader of the Mate 20 Pro can’t be officially unlocked, as Huawei has stopped giving official bootloader unlock codes. We continue to remain disappointed by Huawei’s decision and hope that the company reverses its policy in the future. Finally, we turn our attention towards pricing, competition, and the value proposition. The Mate 20 Pro is sold for ₹69,990 ($1,000) in India. It’s not officially available in the US, but the global variant can be currently bought on Amazon without warranty for ~$842. The phone is likely to receive a price cut in the weeks after the launch of the Huawei P30 series. The Huawei Mate 20 Pro’s primary competitor is the Samsung Galaxy S10+. The Samsung Galaxy S10+ is slightly more expensive than the Huawei Mate 20 Pro, and the two competitors are very closely matched in terms of specifications. 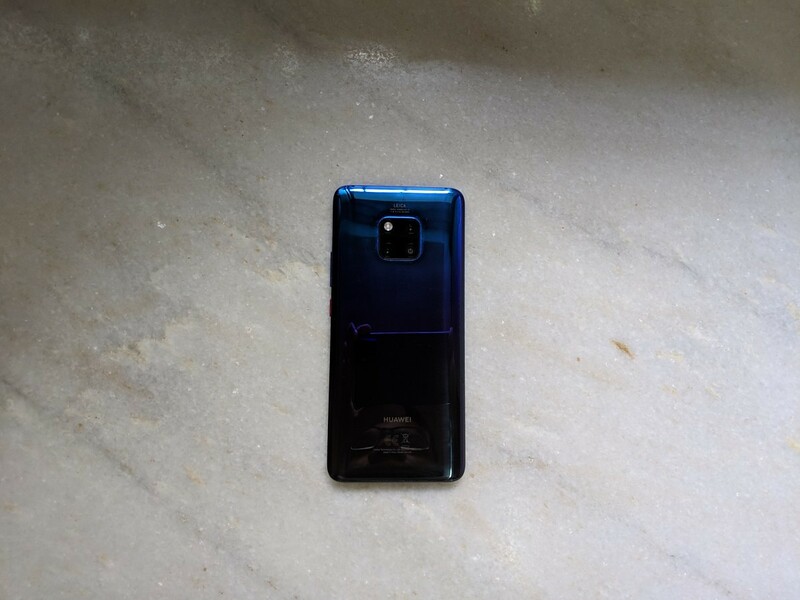 The Exynos international variant of the Samsung Galaxy S10+ has a slightly better display, pill-style display cutout versus wide notch, a faster GPU, more RAM in India (8GB vs. 6GB), a microSD card slot, [email protected] video recording, ultrasonic versus optical in-display fingerprint sensor, and a 3.5mm headphone jack. The Huawei Mate 20 Pro, on the other hand, has its own advantages: a better CPU with faster system performance, better rear cameras, 3D facial recognition, much faster wired charging (40W versus 15W), better battery life, and a cheaper price tag. The Huawei P30 Pro is one to watch out for. At launch, it will probably be more expensive than the Huawei Mate 20 Pro. Prospective Huawei Mate 20 Pro buyers should, therefore, wait for the Huawei P30 Pro’s launch to benefit from the likely price cut that the Huawei Mate 20 Pro will enjoy. Other competitors of the Mate 20 Pro include the Qualcomm Snapdragon 855-powered Xiaomi Mi 9, LG G8 ThinQ, Xiaomi Mi Mix 3 (which will soon be joined by a 5G version), LG V40 ThinQ, and the Google Pixel 3 XL. On the lower end of the price spectrum, the Huawei Mate 20 Pro faces competitors in the form of the surprisingly capable Honor View 20, as well as the OnePlus 6T. The list of competitors is only certain to grow over the next few months, but the Mate certainly doesn’t seem worried so far. Overall, the Mate 20 Pro was the epitome of Huawei’s flagship efforts in 2018, and even 2019 flagships are only now starting to catch it in terms of its feature set and package. That speaks volumes about how good the phone is. For users who care about low light camera performance, fast charging, and 3D face unlock, the Mate 20 Pro still remains one of the best phones out there.